Protect your GMX File Storage App for Android against unauthorized access by creating a PIN. 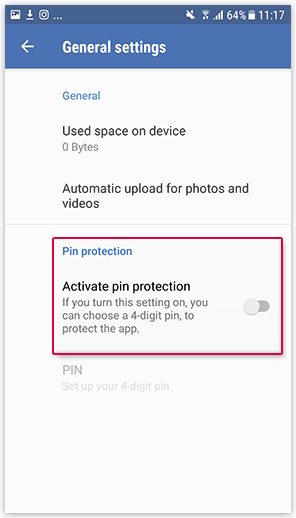 Turn on Activate PIN protection under PIN protection. The window Enter PIN appears. Enter a PIN and confirm it. If you want to change your PIN, you have to enter your old PIN first to unlock before you can enter a new PIN. If your Android smartphone has a fingerprint sensor, you can activate the fingerprint protection instead of the PIN. Then you can easily access your device without having to use a PIN. The fingerprint protection has to be enabled in the system settings of the device. Tap OK to activate the PIN protection mode. The access to your GMX File Storage App for Android is now protected with a PIN.